Because lemon-pepper seasoning is a traditional mate to chicken, we decide to play with that flavor profile for Beyond Meat Chicken-less strips. And it’s a match made in vegan heaven! The bright lemony flavor combines beautifully with a peppery kick. We added an herbed mayo, some arugula and tomatoes for a delectable lunch. This is great for packing for work or school or picnics, and it holds up okay in the fridge overnight if you use a crusty bread. You can use fresh or dried herbs in the mayo, or any combination thereof. If you want to use fresh herbs (basil is especially amazing fresh in this mayo! ), use 1 Tbl. instead of 1 tsp. Start by cubing or shredding the Beyond Meat strips. To shred it, use a fork and twist. (This looks a LOT like real chicken when it’s shredded, as a side note, in case you’re not into that – or if you are, go nuts!). The layers of the Beyond Meat strips will pull apart. Combine in a bowl with zest and juice from one lemon, olive oil, pepper and salt. Allow to marinate for 30 to 90 minutes to maximize flavors. Meanwhile, combine vegan mayo with all herbs, dijon and minced garlic. Set aside. After 30 to 90 minutes, add mayo to the Beyond Meat and mix gently until all pieces are coated. 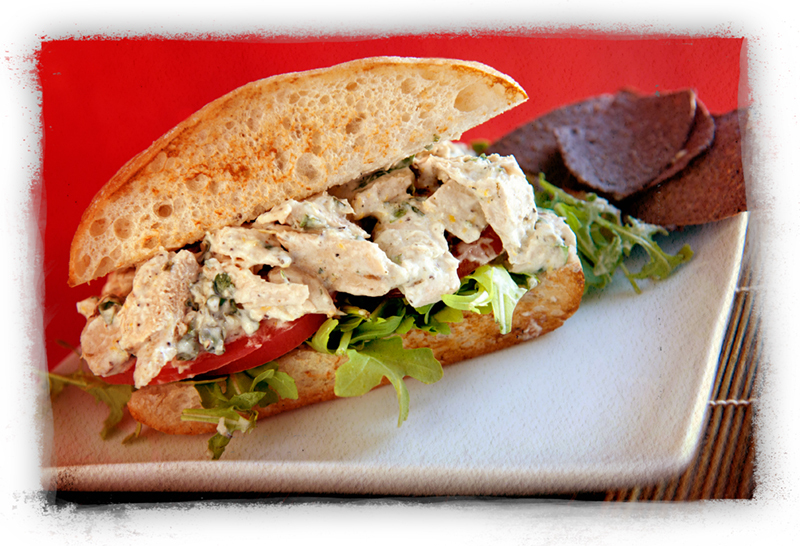 Spoon onto four sandwiches and top with arugula, tomatoes or you favorite sandwich veggies. Enjoy! Ever hear people say “vegan food is hard to make,” as if they could never tackle such a complex endeavor? Let’s end that right now. Everyone needs a few really simple, fast recipes. This one is perfect for workplace cafeterias, dorm rooms, even hotel rooms. All you need is a microwave, can opener, spoon, sink and bowl to cook in. There are only 3 ingredients and they can all be picked up at any grocery store. It’s complete with starch, protein and even some tomatoes. Any can of vegan tomato soup will work, and lots of cans are vegan friendly: Progresso, Dr. McDougall, Trader Joe’s, Muir Glen and Health Valley Organics all have offerings. Many store brands are vegan, too. You can make this on the stovetop or in a microwave. Literally, it’s ready in about 5 minutes. You can’t even order a pizza this fast! It serves two or four, depending on how much you eat, and if there’s a side dish, like an apple or bag of kale chips, to round out the meal. The recipe is also flexible, you can swap in and out different beans or soup flavors, depending on what you have handy. Like I said – ideal for students, travelers and folks eating in an office cafeteria! Hot food in minutes! This was a favorite of mine in college and still is during hotel stays. Hope you like it too! Open garbanzo beans; drain and rinse. Empty tomato soup into a saucepan for the stovetop or a microwave safe dish for the microwave. Heat thoroughly until bubbly at edges. Add couscous and beans, sit and cover. 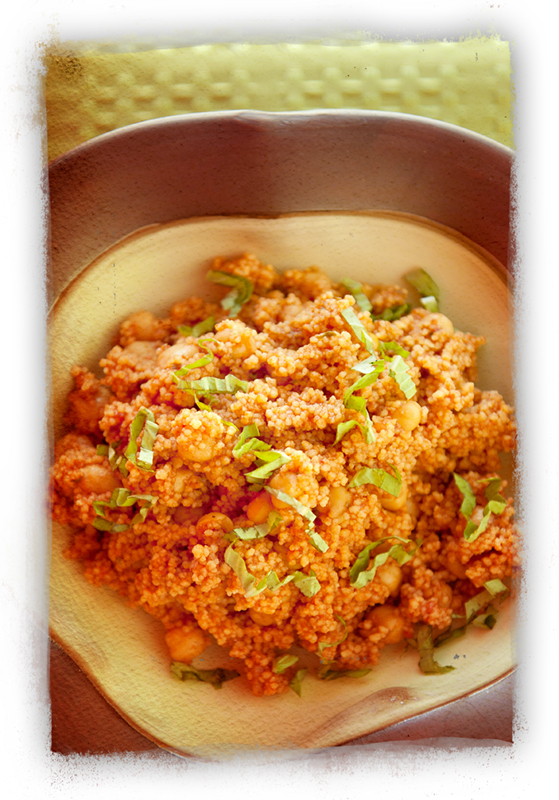 Allow to sit for about 5 to 8 minutes, until couscous has absorbed all liquid. Fluff and eat. In the world of organic alcohol, wine seems to take spotlight, with beer waiting in the wings. But vodka’s day has come to the organic market. Choosing organic beverages means ingredients used to make your fermented drink are aren’t sprayed with toxic insecticides, herbicides, fungicides, and fertilizers. These unhealthy chemicals pollute water, air, and soil. Researchers at Cornell University estimate that at least 67 million birds die each year from pesticides sprayed on US fields. The number of fish killed is conservatively estimated at six to 14 million. And, many pesticides are toxic to humans, according to the US Environmental Protection Agency. Chemicals that, when ingested frequently, can potentially increase the risk of cancer other health risks. Chemical-free organic drinks often taste better, too. Why not try it out for yourself and check out these lovely vodkas? Rain and Square One are among our favorites in the bunch. 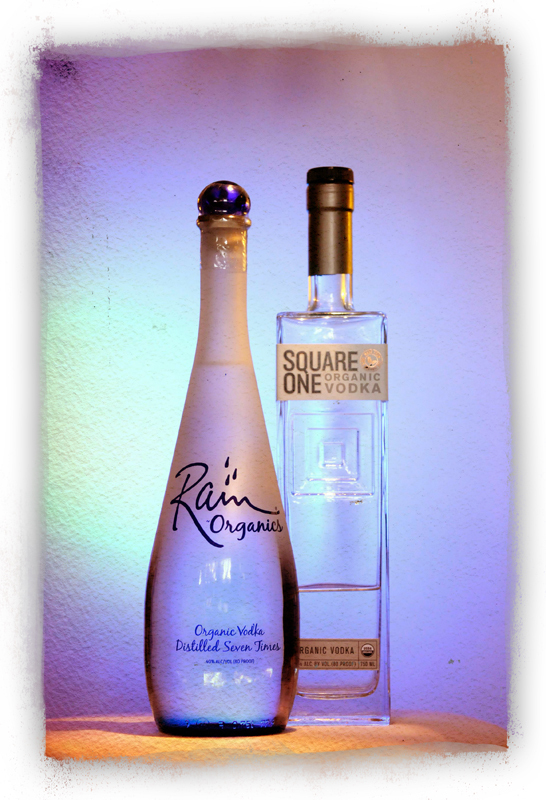 Rain is really smooth vodka and is distilled seven times! This is the bottle you want for vodka-tonics. It’s also vegan-friendly and comes in original, mango and cucumber flavors. Square One makes vodka in original, cucumber, botanical and basil varieties. Botanical is really interesting it’s infused with the essence of eight herbs & flowers: pear, rose, chamomile, lemon verbena, lavender, rosemary, coriander and citrus peel. These bottles are also vegan-friendly and make for smooth drinking – and perfect cocktails. But among the bunch of organic vodkas there’s also Praire, American Harvest, Crop and Ocean. We’ve tried Crop and Praire, and both are also good, solid vodka. Now you’re ready to try these liquors. And we’ve got a bright, refreshing cocktail for you. This is fun for girls’ night and the gorgeous pink-ness make it perfect for occasions like Bridal Showers. 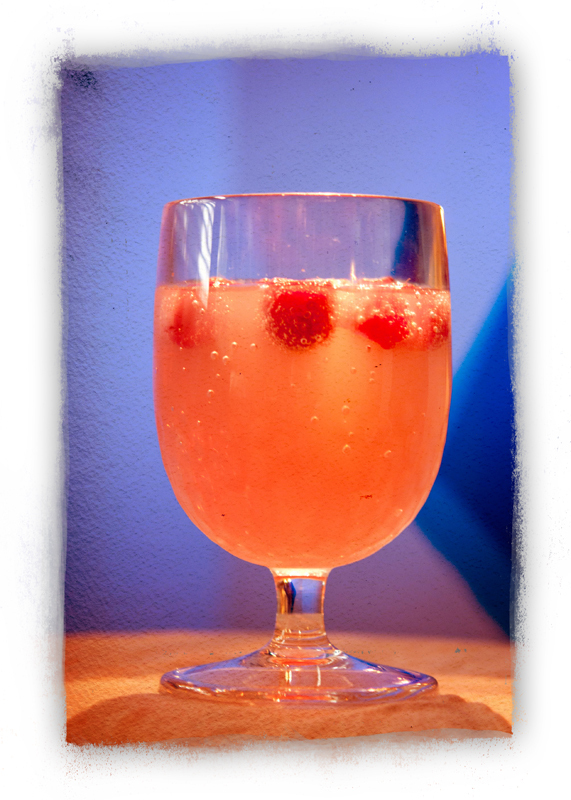 Combine vodka and limoncello in serving glass, top with cherry-lemon sparkling water and float a few frozen raspberries in the glass. Enjoy! Today is the final day of our fancy salt feature. And we saved the best for last: dessert. 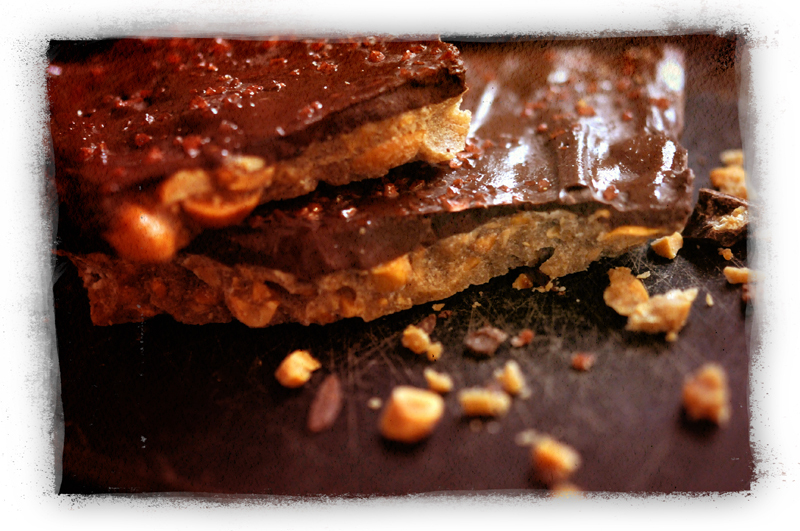 This salty offering will take you back to childhood and your grandma’s kitchen: peanut toffee. In a shallow skillet, toast peanuts lightly. As soon as they are brown and fragrant, set aside. Coat a 12-inch glass dish with non-stick spray, pour in 1/2 the peanuts and set aside. Over a double boiler on low heat, melt the chocolate. Keep on very low heat, so chocolate doesn’t set up, as you prepare the toffee. In a heavy bottom saucepan over medium-low heat, add Earth Balance and melt; then add sugars and cayenne pepper . As the ingredients melt and break down, stir constantly for about 7 to 9 minutes. When the toffee is ready, the edges will bubble and the mixture will be brown and stiff – but still pilable. Quickly stir in the remaining toasted peanuts and remove from heat. Pour toffee mixture into glass dish over the other peanuts. Press flat with a spatula and quickly coat with melted chocolate. Sprinkle Himalayan pink salt over chocolate before it sets up. Place candy in a cool area for about one to two hours to harden. When it has set up, break apart into bite size pieces. Store in the fridge, if it lasts that long. To find Himlayan pink salt, try SaltWorks, World Market, Amazon or Whole Foods Market. It’s day 3 of our feature on salt. Today, we are exploring black volcano salt from Hawaii in a savory and unusual rice-based main course. The flavors of pineapple, coconut, red pepper flakes, ginger and garlic meld in this hearty supper. The black volcano salt really accents the unique combination of textures and tastes! Each bite will transport you to a far-away place with ocean breezes and swaying palm trees. It makes enough to serve four people, but really, the two of us easily ate it all. Saute garlic, red pepper flakes and ginger in coconut oil over medium heat until fragrant, about 2 minutes. Add black volcano salt, coconut milk, vegetable stock and brown basmati rice. Bring to a boil, then cover and reduce heat. Simmer rice until done, about 45 to 50 minutes. Meanwhile, in a shallow skillet over low heat, toast 1/2 cup of macadamia nuts until lightly browned. You will smell them when they are done. Set aside and in same pan, toast 1 cup unsweetened coconut flakes. When rice is getting close to completion, grill pineapple rings and scallions until warmed and caramelized, about 5 to ten minutes over medium heat. A grill pan is great, but the same shallow skillet you to toast the nuts will work, too. After the rice is cooked through and fluffy, mix in the toasted macadamia nuts and coconut flakes. Serve with pineapple and scallions on top of rice and sprinkle a liberal pinch of black volcano salt on each dish. Looking for black volcano salt? Try Amazon, The Spice House or Salt Works. We’ve also seen this salt at Marshall’s for a steal! Our first recipe using fancy salts… Anyone can tell you how delicious fries are. Crisp, crunchy, savory finger food, complete with salty goodness. 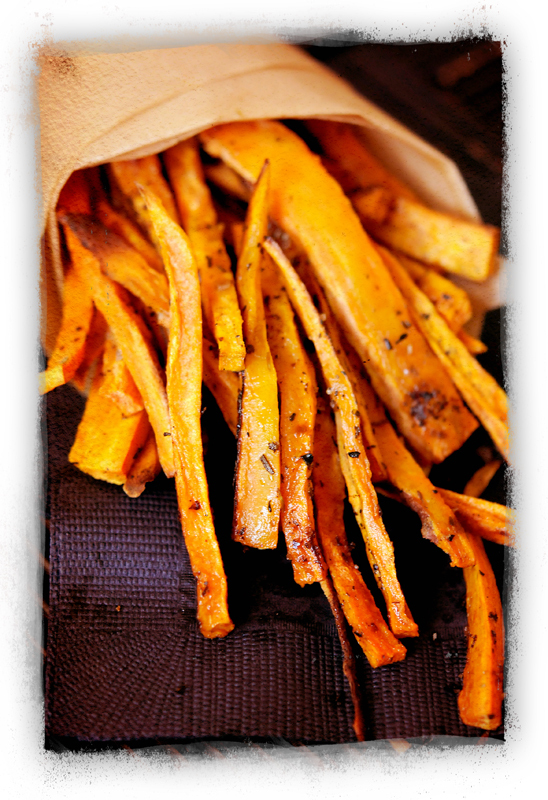 We made these fries with hand cut sweet potatoes and Herbs de Provence salt. Preheat oven to 425 degrees. Line a large baking sheet with parchment paper or a Silpat. Cut sweet potatoes into long thin strips, like fries. Toss in a large bowl with coconut oil to coat and spread across the baking sheet in a single layer. Sprinkle liberally with Herbs de Provence salt. Bake at 425 for 15 minutes, then take out and stir/rearrange the fries to ensure even crisping. Place back in the oven and bake another 10 to 15 minutes until hot and crunchy. Allow to cool a few minutes before you dig in. Sprinkle with more Herbs de Provence salt is desired. 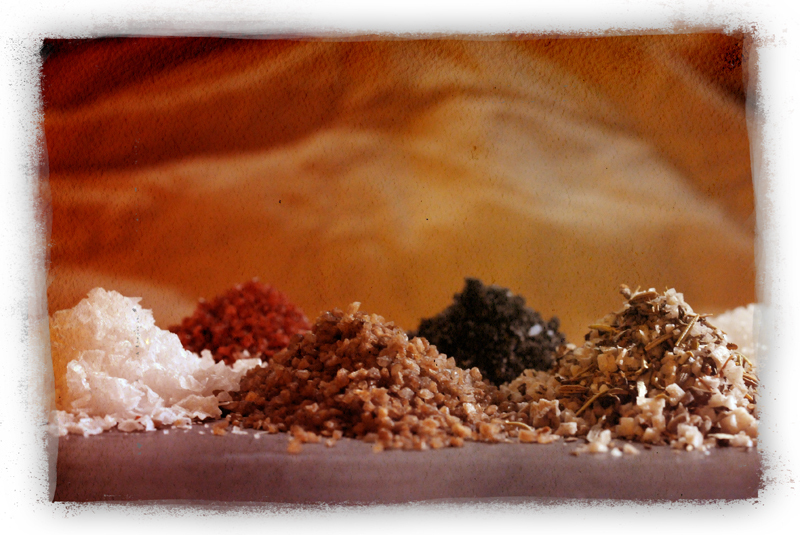 To find Herbs de Provence salt…. check out Williams Sonoma, WholeSpice, Whole Foods or Dean & DeLuca. You can also make your own by adding an Herbs de Provence blend to salt. Salt. It’s almost a four-letter word these days. Companies toss it by what seems like buckets into processed food; newscasters share stories that salt is the devil. And what happens? Salt as a culinary ingredient can be overlooked. I don’t mean the crappy white powder on the table in a diner, partially filled with rice. I mean true, unprocessed salt – the only rock eaten by people. Salt is a crucial element in all life on Earth. People have built entire civilizations around salt. Going back to times B.C, salt was used by Egyptians to make mummies and was a high-end trade item between Phoenicians and the Mediterranean. Rome constructed its empire around salt mines and many people died to preserve their nations’ saltworks. The word “salary” was derived from the word “salt.” Salt was highly valued until recently and its production was legally restricted in ancient times, so it was historically used as a method of trade and currency. The word “salad” also originated from “salt,” and began with the early Romans salting their leafy greens and vegetables. Before refrigeration, salt was the main method of food preservation for people though out history. Food stuffs of all kinds have been salted, cured, brined and pickled with a variety of methods and recipes. Salting was used because most bacteria, fungi and other potentially pathogenic organisms cannot survive in a salty environment. Any living cell in such an environment will become dehydrated through osmosis and die . Religion even links to salt. Egyptians, Greeks and Romans included salt in offerings and rituals. In both Islam and Judaism, salt seals a bargain because it is immutable. The Torah (Leviticus 2:13) speaks of a “Covenant of Salt,” where God instructs the use salt on all the offerings as if to say that His covenant with those of the Jewish faith is eternal, sealed with salt. Since salt never spoils, it is a symbol of indestructibility. Thus, it has role in current Jewish faith as well. Salt is an excellent cleaning agent, either on its own or in combination with other substances. A salt and vinegar paste cleans tarnished brass or copper. A strong brine poured down the kitchen sink prevents grease from collecting and eliminates odors. Salt drives away ants and moths. A salt and oil paste removes white marks caused by hot dishes or water from wooden tables. Salt is also useful in the bathroom. It makes an excellent mouthwash, throat gargle or eye-wash; it’s an effective antiseptic; and it can improve skin complexion (think those fancy salt scrubs from places like Lush). And even with all this history and many purposes, modern society thinks of salt as “bad.” The reality is that people can’t live without salt. Many folks overdo, of course. Salt is critical for digestion. It does more than accent food flavors. Without salt, which the body cannot make on its own, humans would be unable to transmit nerve impulses,transport nutrients or nerve impulses or move muscles – including the heart! Salty tastes trigger production of saliva and gastric juices, both essential for food digestion. We are also constantly losing salt, so there is a need for regular replenishment. Even animals instinctively know they need salt. If you live near wild deer, elk or moose, hang a salt lick on a tree. These critters will show up to take advantage of all the essential minerals. Alas, salt is a sublime substance. Wars have been fought over it. Civilizations have fallen for lack of it. You wouldn’t be alive without it. Salt is part of us all. Put down that crappy processed salt in the blue canister you’re holding right now. It’s time for an upgrade to real, gorgeous salts. In our various travels we cross paths with many awesome, small vegan companies. Anything Vegan is one of those. 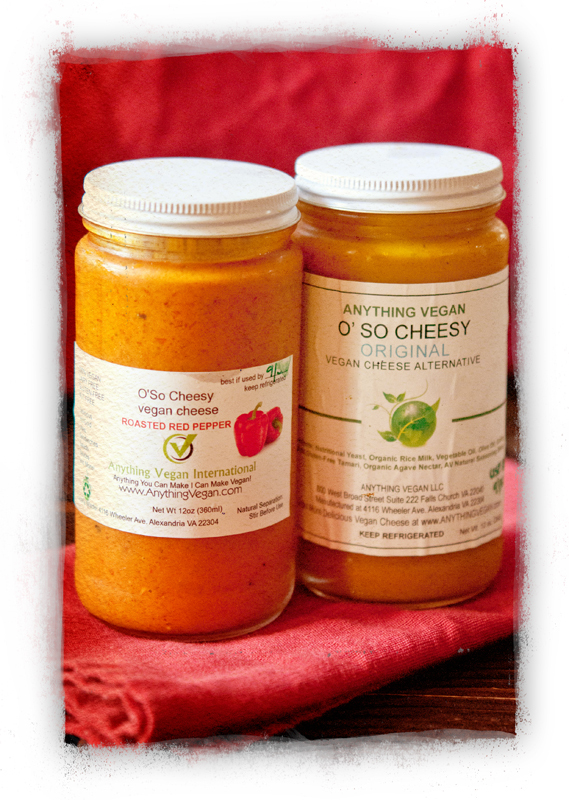 We met them at an event in Washington D.C. and bought two jars of their O’So Cheesy vegan cheese alternative sauces. What can we say but… hot damn! They are good! Based in Virginia, Anything Vegan is made of up of two chefs, Jasmine and Marjorie and their motto is “Anything you can make, I can make vegan.” Which rocks! They offer vegan coaching services, home chef services and have written two cookbooks: Juice Power and How to Create a Very Merry Vegan Holiday Meal. Both are available for your Kindle or e-reader. To be totally honest, we ate a good deal of it off spoons. I’d like to say we at least poured it into a cute dish and dipped in sliced carrots or broccoli or even chips. That would have been great, too. The reality is, it didn’t make it that long. It was just too darn delicious. At the event where we met them, they were giving away recipe booklets for the O’So Cheesy sauce, which included menu ideas like Vegan Bacon & O’So Cheesy Roasted Red Pepper Stuffed Mushrooms, O’So Cheesy 7-Herb & Garlic Baked Eggplant Rolls and Vegan O’So Cheesy “Hamburger” Soup. Alas, our jars of cheesy goodness didn’t last long enough to try these! But while you’re on their site, there are some recipes worthy of your time – be sure to look at Apple-Almond Buttery Pancakes, Stuff Me Vegan Sensuous Stuffing, Super Food Herb Garden Burgers and Mushroom Pate Pastry. While you can find lots of photos of this wonderous O’So Cheesy sauce on the website, there is not a link to buy it online, nor directions on where it is available locally. It could be that the site is under construction. Perhaps drop the ladies an email if you want some. 🙂 Thanks Jasmine and Marjorie – we cannot wait to get more O’So Cheesy sauces!! Somethings we are always on the prowl for. One of those things is a vegan dog treat that our finicky greyhound will eat. Fruitables were a lucky find. And damn – these things smell SO DELICIOUS, it was all we could do not to sample them ourselves. Now, before you get to the Fruitables website, be aware that their entire line is not vegan. They do make jerky and other stuff, too. But the vegan options are pretty awesome. In the “Crunchy” variety, there are Sweet Potato & Pecan, Pumpkin Blueberry, Pumpkin Apple, Pumpkin Banana and Pumpkin Cranberry. In the chewier “Skinny Mini” line, there is Pumpkin Berry and Pumpkin Mango to choose from for your pooch’s needs. 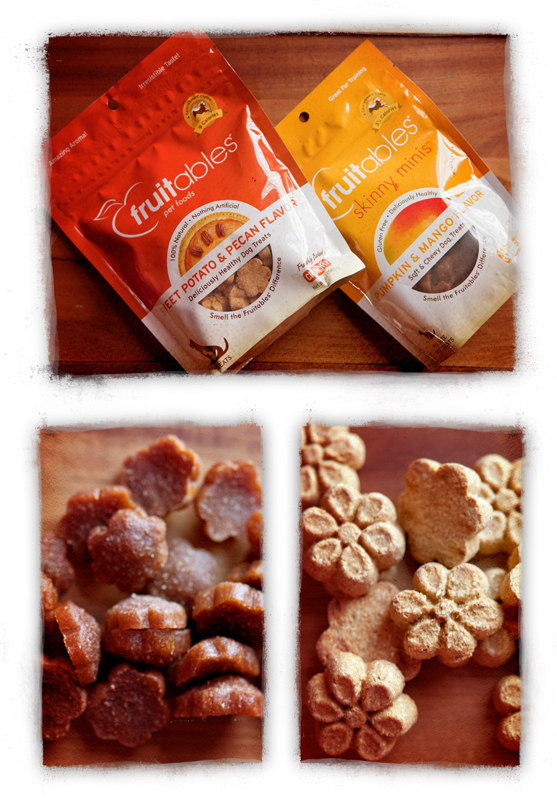 Fruitables are made entire in the USA and are designed with optimal pet nutrition in mind. They use real ingredients and some organics. The list on my bag of Sweet Potato & Pecan dog treats includes such easy-to-recognize foods as sweet potato, organic oatmeal, pearled barley, potatoes, oat fiber, canola oil pecans and cinnamon. Love that. The bag also states that the product is free of wheat, corn, soy and artificial ingredients. We bought our Fruitables cookies locally at Bark! in Clarksville, MD. You can buy these online from Amazon.com or use their handy search to find a store near you. Seriously – get these dog cookies and inhale deeply when you open the bag. Even homemade doesn’t smell this heavenly! Your dog will agree, no doubt. 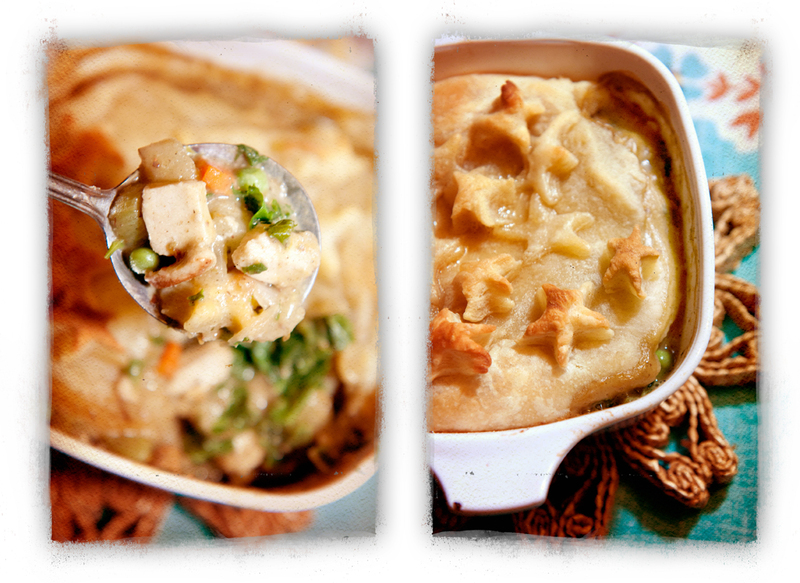 Since going veg, there hasn’t been chicken pot pie in our lives. Over a decade for the dirty hippie; almost two decades for me. I remember many family dinners, helping my mom prepare chicken pot pie as a child – rolling out the homemade dough, cutting up celery and carrots. Because it was a lot of work, it was usually reserved for weekend meals or special occasions. But with Beyond Meat, that retro classic is back in action. Preheat oven to 400 degrees. Gather six individual glass or ceramic oven-safe dishes to bake the pot pies in. Set aside. In a large pot or dutch oven, add grapeseed oil, shallots and garlic. Saute over medium-high heat for about 3 minutes until soft. Add carrots, celery, peppers, potatoes and Beyond Meat. Continue sauting, stirring often until veggies are tender and Beyond Meat cubes are lightly toasted. Add kale and fresh parsley, season to taste with salt and pepper. Turn veggies down to low heat while you make the roux sauce. Before starting the roux, add ground flax seed to one cup of water and set aside. It will get thick and a little gooey. Roux isn’t difficult, but it needs your full attention. Bring veggie stock up to a low boil and add flour while whisking constantly. Turn heat down to medium and add safe, thyme, marjoram, nutritional yeast and arrowroot. Keep whisking! The roux will be thick and a little pasty. Add almond milk and flax seed/water combo. Stir up until well combined. Set your six small dishes on a large baking sheet (in case of overflow in the oven). Spoon the cooked veggies and Beyond Meat into the dishes in equal amounts. Follow with the herb roux sauce until all six dishes are very full. Unfold the puff pastry sheets and if needed, roll out a little bit. Don’t overdo it with rolling, or the pastry layers won’t puff up. Cut six copies of the shape of your dishes. If you have leftover puff pastry, you can make cut shapes like stars, hearts, etc, to decorate the pot pies with. Top the pot pies with the puff pastry cut-outs and decorate if desired. Brush the tops of each pot pie with melted Earth Balance or olive oil. Bake at 400 degrees for 25-30 minutes, until pot pies are lightly browned on top and bubbly at the edges. Eat while still warm. Serve with a small side salad and red wine. Perfect winter dinner party – done!